Lynx spotten in southern Vt.
LONDONDERRY—A lone Canada lynx was photographed in the southern Vermont town of Londonderry this past June, marking the first confirmed evidence of lynx in Vermont outside the Northeast Kingdom in decades. Lynx are listed as “threatened” under the federal Endangered Species Act and “endangered” in Vermont. 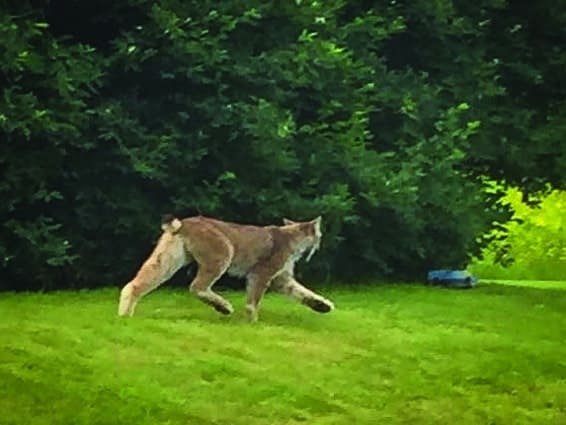 The lynx was photographed in the back yard of a rural Londonderry home, according to an Oct. 19 news release from the Vermont Dept. of Fish & Wildlife. Biologists with the department confirmed the identification of the animal from the photos and visited the site to confirm the location of the photos. Since that time, a wildlife camera photo has emerged that biologists suspect is also of a lynx in nearby Searsburg. The photo was taken in May shortly before the Londonderry sighting, but was only recently noticed by the University of Vermont student who had set the camera trap out as part of her wildlife research. The animal was photographed while it was passing under Route 9 using a wildlife underpass created in partnership with Vermont Fish & Wildlife and VTrans. Male lynx are known to disperse over long distances, so Bernier believes that there is a strong chance this may be the same lynx in both sightings. Biologists regularly monitor lynx habitat in the area and have not picked up other evidence of the animals locally, indicating that it is unlikely that lynx have established a resident population in southern Vermont. Lynx are strongly tied to large, unbroken forests of spruce and fir trees with high numbers of snowshoe hares, their primary prey species. Forests of this type are mostly found in Vermont in Essex County and are less common elsewhere in the state. Vermont Fish & Wildlife actively monitors for lynx in the Nulheegan Basin of Conte National Wildlife Refuge and at the Bill Sladyk and Victory Basin wildlife management areas, in partnership with the U.S. Fish & Wildlife Service and Plum Creek Timber Co. Survey work in 2016 was unable to detect a resident population anywhere in Vermont despite increased survey efforts. An elusive Canada lynx is photographed running across a backyard in Londonderry.